The Sub-Vers TF is a powerful sub-ohm tank that can conveniently be filled from the top, preventing messes and making on-the-go filling easier than ever. 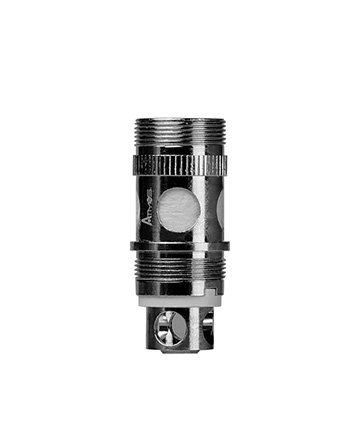 The tank uses replaceable sub-ohm atomizers built at 0.5ohms that are wicked with pure organic Japanese cotton. And hardware is comprised of stainless steel and a glass tank capable of holding an impressive 3.5ml of liquid. The Sub-Vers TF has an adjustable airflow design. Using the rings located at the bottom of the tank, users can adjust the amount of air moving through their device to create bigger clouds and better taste. The Sub-Vers TF Cartridge is a great cartridge with a great atomizer! Filling the Sub-Vers TF is super-easy - always a plus. This is a plus compared to the difficulty in filling ANY bottom-fill cartridge. One of the best parts of this cartridge is the atomizers. They have LARGE wick holes! This makes vaping thicker e-juices easy. I've been using this cartridge daily since I received it in early Dec of 2016 and have since purchased a second Sub-Vers TF Cartridge (this time - in BLACK). I'm extremely happy with the performance of this tank. It works great and looks awesome. Anyone using the Sub-Vers TF Cartridge will be pleased. Absolutely the best cartridge I own. Able to hold a generous amount of oil and the ease of refilling from the top is great. I use it with my i50W-TCJ battery for great vaping sessions. The ability to swap out different atomizers are a great feature I look forward to using.